Cathy's Card Spot: Autumn butterfly, or is it a moth! Hi again, I'm back with another infusions experiment! This time I spread white texture paste through this butterfly stencil, then sprinkled some infusions powder on. When it was dry I spritzed it with water, the infusions still reacted and created this autumn coloured background! Hubby thinks it looks more like a moth than a butterfly! Either way I still like it. 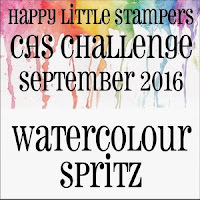 The challenge at Happy Little Stampers CAS is watercolour spritz. 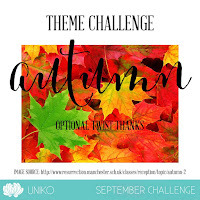 The theme at Uniko Studio is autumn with the option of thanks. I layered the butterfly panel onto a scrap of chipboard, from the back of a notepad, and added gold rub on paint to the edges. 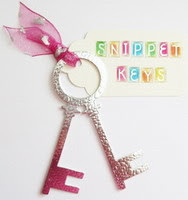 Using scraps or snippets means I can visit the playground at Pixie's Crafty Workshop. Dreamweaver stencil; texture paste; Paper Artsy infusions; entangle embossing folder; Craf-T products gold rub on paint ; sentiment sticker. Okay, I went with autumn moth too! I think it's stunning and has so much texture. Great work. Thanks so much for playing along with Uniko this month! Deborah, DT. This is another beautiful experiment that came out wonderful. Good for you trying things and making these stunning cards! I think it's a moth too - that background you've made is gorgeous! The butterfly has real texture and looks beautifully velvety. Love it! Thanks for playing along at Uniko. Hi Jill, couldn't find an email address for you on google+ so am replying here. The ef is Couture Creations Entangle. I'm pretty sure it's retired. It does look like cornelli work though! Butterfly or moth, this is beautiful, Cathy! As a moth, it would make a fabulous masculine card. It is really stunning Cathy. Oh wow! This is stunning. The colors are so beautiful. This is a lovely Birthday card. Great colours here.